The U.S. is under international criticism because under its Intergovernmental Agreement (known as IGA) reciprocal exchange accords, the U.S. has already transmitted information on those who are tax residents outside the U.S. to respective national tax authorities under the IGA. The spotlight is on the U.S. because the U.S. has made it clear that it does not currently intend to adopt the CRS. The rationale behind the U.S.’s decision is that FATCA “gets it done” and fulfils the needs of the U.S. This decision leaves the U.S. as a “non-participating jurisdiction” under the CRS regulations. CRS provides for governments to annually and automatically collect and exchange with other participating governments bulk financial account information, such as balances, interest, dividends, investments, and proceeds from sales of financial assets. It covers accounts held by individuals and entities, including businesses, trusts, and foundations. Not just banks, but broker-dealers, investment funds, and insurance companies are required to report. CRS is a minimum standard. Each participating country enacts its own laws and issues its own rules, regulations, and guidance for implementation, potentially imposing additional requirements in the process. As a result, CRS is unlikely to be a truly common standard across all countries, therefore complicating reporting and compliance efforts. The result of the U.S. being a non-participating jurisdiction is that all FI’s in the CRS will need to treat any U.S. Reporting FI as a Non-Financial Foreign Entity (NFFE). This means that any CRS FI holding an account for a U.S. FI (such as a trust in Wyoming, South Dakota or wherever), will need to “look through” the U.S. FI and establish, and report if needed, on its controlling person(s). CRS requires automatic audits of clients who fail to provide the necessary documentation in a participating jurisdiction. Therefore; custodians may decide not to do business with any entity in a non-participating jurisdiction, like those located in the U.S., who are not able, or not willing to send the required information. CRS Classification. Every U.S. entity needs to make a determination of its CRS classification and determine its residency for CRS purposes because affected U.S.A. entities will be required to provide documentation to counterparties in participating countries. This determination is made on the Self-Certification Form (there is one for entities and one for individuals) that is provided by the FI. Investment Entity Requirements. CRS requires any type of investment entity (mutual funds, trusts, LLCs, and other flow-through, partnership-type entities) located in a non-participating country, such as the U.S., that have a relationship with a FI in a participating country, to identify and document all of its controlling person(s) and pass it to the FI in the participating country. Publicly traded entities are not exempted from this rule. An example stated in the article is: a publicly traded U.S. mutual fund that holds UK securities. The securities are held by a custodian within the UK, which is a participating CRS jurisdiction, therefore requiring the fund to pass information to the custodian regarding its entire controlling person(s) prior to payments. Under current guidance, controlling person(s) may potentially include investors, who are changing by the moment, making compliance extremely difficult, if not impossible. Residency Determination. An entity that by all appearances is established in the U.S. may be interpreted by the CRS to have a controlling interest through a trustee residing in a CRS participating country, thus subjecting it to CRS requirements. FATCA only requires identification of U.S. persons; the CRS requires determining whether controlling person(s) are tax residents in any of the more than 90 countries so far signed onto the CRS. As noted above, the U.S.’s non-participation in CRS imposes particular and potentially difficult requirements on many U.S. entities. The rules and reporting requirements are complex. The affected entities need to start the analysis of necessary implementation steps. It is important to note that the local jurisdictions are expected to introduce local penalties for non-compliance. The OECD has a Section on the Standard that addresses effective implementation under the Commentary on Section IX. Net net, CRS needs to be taken very seriously, and action needs to be taken now. 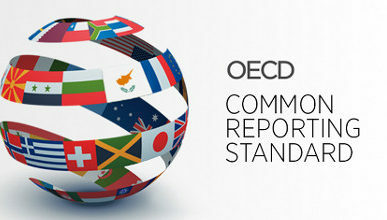 After all, what country would like to fail an OECD Global Forum Peer Review on their compliance? Consult with your tax specialist.